Prompt delivery of bike, not much good when you receive a Danish hand book which you can't read. Unfortunately we are unable to deliver to addresses containing non-western characters due to restrictions from our couriers. To continue, please cancel the order, checkout with PayPal again, supplying an English translation of your address. Please accept our apologies. The Authorisation was Declined by the bank. Thanks for the email and sorry to hear about this. We can see you have made two attempts to place an order (09/11/2016), however both attempts have proven incomplete and no payment has been taken. Sorry about this. After a quick check, we can see that we are notcurrently experiencing any issues with our online payment systems, and we arestill receiving successfull orders internationally. Please head to you browser settings and try to cancelthe cache, cookies and any internet history as this quite often helps refreshyour brower to accept a payment. Otherwise, please try another device/browser. As a final point, please contact your bank/card holderto make sure they are not blocking the payment for any reason. I hope this helps. Apologies for any inconvenience. After investigating this further with the accounts department we can see we have infact received a payment from you. Please confirm if you would like us to continue processing your order and dispatch this out to you? We cannot cancel and refund an order that is out for delivery. According to the tracking, delivery of your goods has been attempted today but you were not in and a card has been left explaining the next step. Just to confirm, our courier has raised an investigation with our delivery partner regarding this. As soon as we have more information we will let you know. 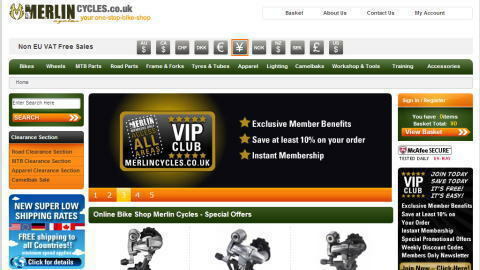 Thank you for your recent order with Merlin Cycles. I am afraid that we have had some issues with our carriers and the delivery of your order. Trakpak have had a large warehouse fire which has caused the loss of a batch of our orders. We have therefore had to re-pick and re-despatch your order for you today. The replacement orders will be shown on your account with a new order number, you will be able to track these as normal. We are very sorry for this inconvenience and the slight delay to receiving your order. Thank you for your patience and we hope that your order arrives promptly. If you wish to add further information to your request, you can do so by replying to this email.